We camped that night at Triabunna which is close to where the ferry leaves for Maria Island. It was cold but waking early enabled me to take some beautiful views of the sunrise over the harbour. Maria Island was declared a National Park in 1972 and offers an interesting history of convict and industrial ruins. It is also appealing for its beautiful natural features such as beaches, forests and limestone cliffs. After exploring the old Commissariat Store and remains of the Darlington convict village, I did the 4-hour return hike up a peak called Bishop and Clerk. This is the highest point of the island. It offered great views back towards the mainland and out to sea in the other direction. The highlight for me though was seeing the art of nature so beautifully in the Painted Cliffs. 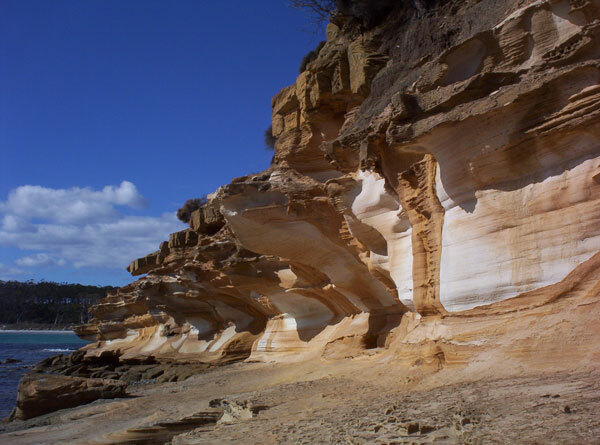 These extraordinary cliffs have been stained various colours by water running down their rock faces. After the ferry returned us to Triabunna we drove south to Kettering for the ferry across to Bruny Island the next morning. We arrived 20 minutes before the sailing at 7.45am and couldn't understand why we were the only car waiting and there were no crew anywhere. It didn't take too long to realise that daylight saving had finished and we were actually an hour early! 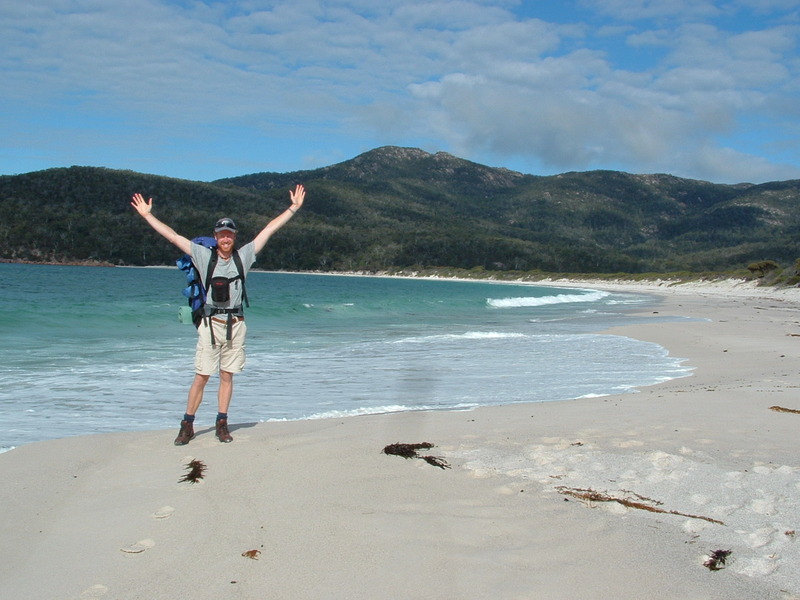 The islands of North and South Bruny are separated by a thin strip of sand dunes called The Neck. They are both rugged and very scenic, especially the south. Our initial destination was Adventure Bay - a place with a rich history of whaling stations and a shelter for explorers like Tasman and Cook. I did the Fluted Cape walk there and although light rain spoiled views out to sea, the highlight of the walk is awesome sea cliffs. Bruny is famous for its wildlife and as I returned to the car and I was fortunate to see a rare albino wallaby. We did a walk around Cloudy Bay before going to Cape Bruny on the southern coast of the island. This windswept point has an old lighthouse built in 1836 that has expansive views over to mainland Tasmania’s southernmost reaches. The cold southerly wind meant we didn't stay there very long and drove right up to Dennes Point at the northern tip of the island. It was a much warmer and more pleasant place to wait for the ferry which departed early evening. The following day we went to Stanley - an attractive and historic coastal town most well known for The Nut. This is an extinct volcano that we climbed and then walked around the top of. It provided wonderful views both out to sea and back over the town itself. After lunch at the beautiful Table Cape we headed south to town of Strahan on the rugged west coast. We only had time for a drive through before going out to Ocean Beach to camp for the night. Our next destination was the mining town of Queenstown. To get there we had to traverse the extraordinary Lyell Highway that winds its way through a surreal, almost apocalyptic landscape of eroded gullies and scarred hillsides. This is the legacy of environmentally destructive mining and the town itself has a pioneer feel to it. The other option of travelling from Strachan to Queenstown is on the West Coast Wilderness Railway which is a four-hour train journey through dense forest and over wild rivers. Southeast from Queenstown is the Franklin-Gordon Wild Rivers National Park where I hiked to the Franklin River before we continued on to Mount Field National Park. It was late afternoon but we just had time to do a two-hour walk to see the Russell, Horseshoe and Lady Baron Falls. All very pretty but would have been impressive with more water. At the end of summer, much of Tasmania seemed to be dry and brown. We also walked though the 'Land of Giants', an area of huge swamp gums - the world's largest flowering plant. The tallest one stands at a massive 79 metres. In the National Park, we drove up to Lake Dobson which is over a kilometre above sea level. It was cold up there so we decided to camp out in the enclosed shelter instead of pitching tents. Despite the rather threatening weather, we walked to one of the alpine lakes in the morning before leaving for Hobart. It was nice to have the luxury of electricity, a comfortable bed and hot shower after all that. We didn't have long to catch our breath because we were on the road to the Tasman Peninsula the next morning. It was a day where we had to dodge a few showers but it wasn't too bad. Our first stop along the way was the former military outpost and convict station of Richmond. Today it is a historic town featuring an old stone road bridge and various 19th century buildings including churches, courthouse and gaol. We also stopped at the Tessellated Pavement which is a beach where the fascinating rock formations look like a stone pavement. The Tasman Peninsula was chosen in 1830 as a ‘natural penitentiary’ to confine convicts. Port Arthur became the hub of a network of penal stations on the peninsula and some 12,500 convicts did hard prison time until 1877. Today it is a place that is full of a sombre, confronting and even haunting history. It’s a poignant contrast of a bleak past set against the genuine beauty of carved stonework, gothic architecture, green lawns and fine gardens. Even the unsettled weather of the day seemed appropriate. The entry fee to the historic site included a harbour cruise and 40-minute guided tour of the settlement. I would love to have spent longer there but the three hours gave me a good chance to learn a lot. The various buildings once sustained convict labour industries such as timber milling, ship building, coal mining, shoemaking and brick and nail production. Tragically, on 28 April 1996 35 people were killed and a further 37 were left injured by a crazed gunman at Port Arthur. Within the site there is a special memorial garden for those who died in this massacre. After the Overland Track we got a rental car to see as much of the island as we could in ten days. 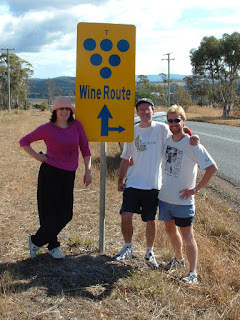 Our very first destination was Ross - a sleepy but fascinating little place about an hour south of Launceston. Originally established in 1812 as a garrison town to protect travellers from bush rangers, it is rich in history and colonial charm. It is probably most famous for its bridge built by convicts in 1836. It is the oldest in Tasmania and third-oldest in all of Australia. Many of the buildings of the same era are now cafes and craft shops. From there, we went to the pretty fishing port of Bicheno on the north-east coast. We walked part of the 3km foreshore footway which starts at a blowhole in the rocks and works its way around past an old whaling station and a couple of beaches. Our destination for the day was Freycinet Peninsula and we arrived at the Coles Bay Visitor Centre late in the afternoon. 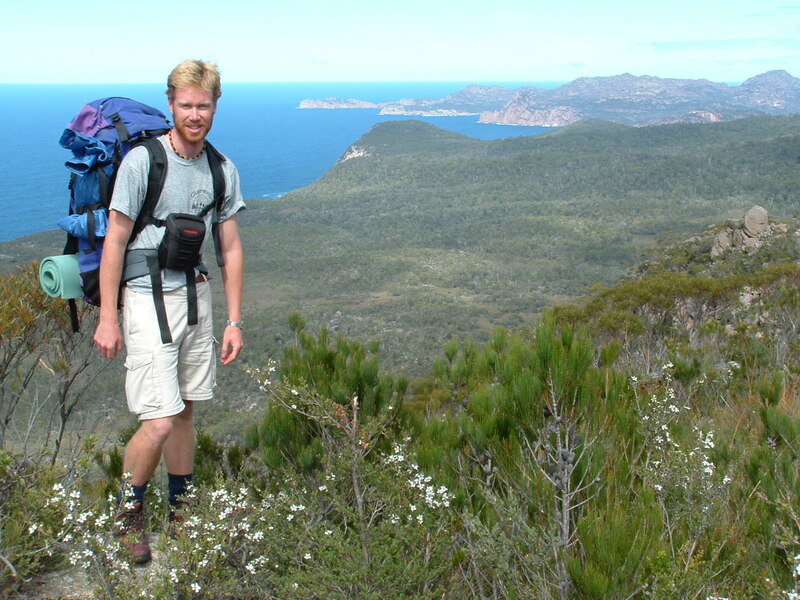 It was time to put the hiking boots on again and explore the beautiful Freycinet National Park. There was just enough time to hike the coastal track to Hazards Beach and although the day had been cloudy, it cleared nicely as we set up the tent. We camped at the south end of the beach and the night in the tent wasn't a good one. We got a few hours rain and the fearless possums got into our food supply. Fortunately we still had enough to see us through the next day and what a spectacular day it was! The rain had stopped by the time we awoke and the day improved to a warm, sunny afternoon. From our campsite on the west coast of the peninsula, we walked down to Cooks Beach and then had a five hour hike up and around the granite peaks of the Freycinet and Graham mountain ranges. This track offered magnificent views down to the end of the Peninsula and back across to Hazards Beach. 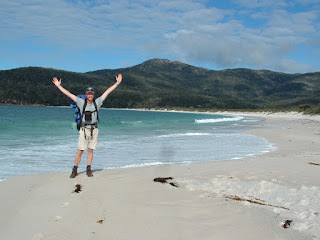 Wineglass Bay was the highlight of the Freycinet Peninsula. This is where the clear ocean waves crash onto a perfect semi-circle of white sand. Our first views of the bay were from up the mountain and the track led us down to the beach. After doing the 20-minute walk along sand we then hiked up to the lookout on the other side which gave us a spectacular view in the late afternoon sun. On the way out of the park we went to the lighthouse which gave us views of the bay entrance and also up the coast toward the Friendly Beaches. Back in our little rental car we travelled west to Deloraine and the Mole Creek National Park. We visited the Marapooka Caves in the park which had amazing limestone formations and glow-worms. We did a quick stop at the Alum Cliffs and then drove on to Sheffield. A nice little town characterised by a number of beautiful murals painted on the side of buildings. We took a walk along the beach in Burnie and then continued along the northern coast. After a long day, we finally made camp at Sisters Beach in the Rocky Cape National Park. 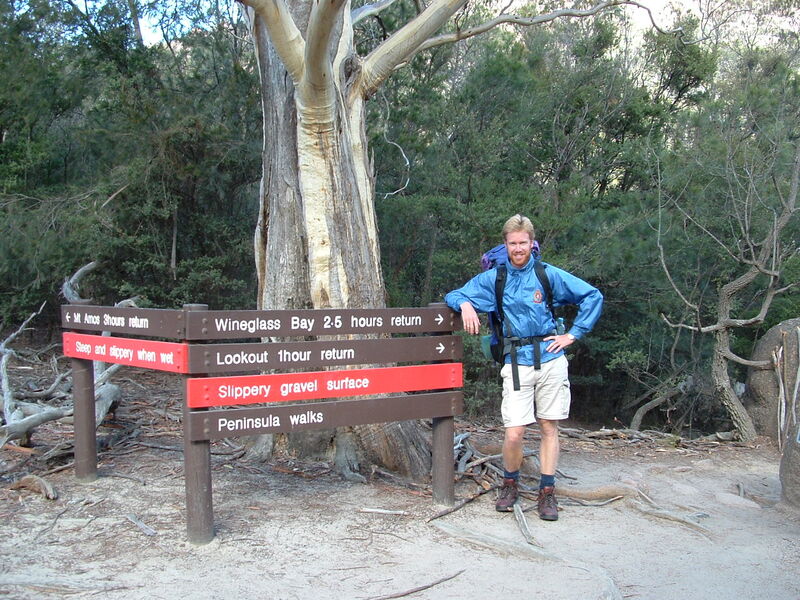 There are several excursions from the main trail of the Overland Track. 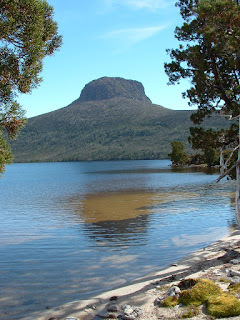 Having already climbed Cradle Mountain and Mount Ossa, we also detoured to Lake Will which offered great views of the uniquely shaped Barn Bluff mountain. The track hasn't been extended all the way yet so we blazed our own trail down to the end of the lake to the lovely Innes waterfall. The D'Alton, Fergusson and Hartnett Falls were other highlights of the track. The warm days enabled me to go for a swim in Lake Windemere. The water was cold but very refreshing and it's a naturally beautiful place. The Australian wildlife along the way was varied and interesting. On the very first day, a wombat casually wandered across the track in front of us. At one of the huts I met the friendly spotted quoll who lives there. Another hut had a couple of very tame wallabies and on the track we saw dozens of little lizards and a few olive green snakes about a foot long. Possums are very bold in their endeavours to get food and we saw a few of them around the huts along the way. The ultimate sight would have been a Tasmanian Devil, but they are a nocturnal animal and difficult to spot during the day. I’d get to see one at a wildlife park later on my travels around Tasmania. I didn’t get to see a Tasmanian Tiger either. Not that I expected to because the last known tiger died in captivity in 1936. Although it has officially been declared extinct, occasional 'sightings' and blurry photos keep the intrigue and mystery alive. 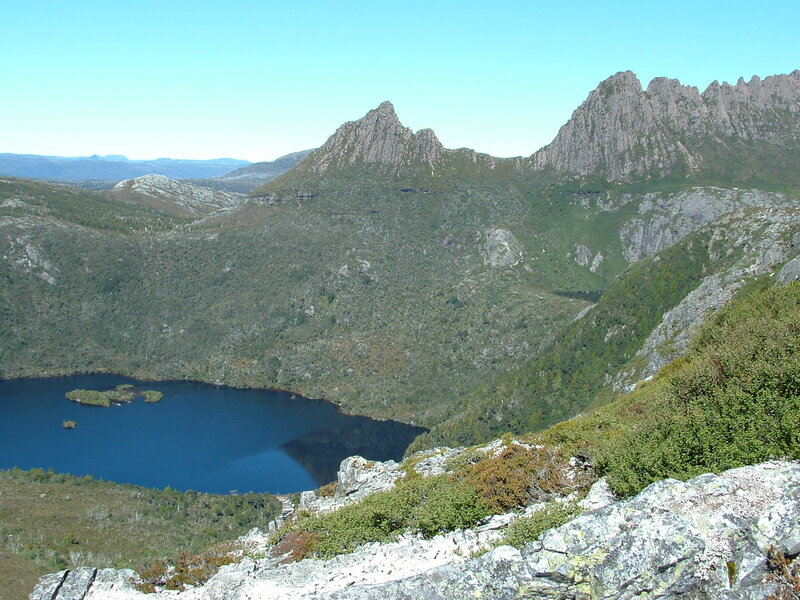 From Narcissus Hut at the north end of Lake St Clair, there is a choice of doing the five hour walk around Cynthia Bay to the end or catch the ferry down the lake. We pushed on to spend our final night at little Echo Point hut and only had a three hour hike to complete about 100km though some of Australia’s most beautiful scenery. Although the skies were heavy and grey, it was a nice feeling strolling out with a much lighter load in our backpacks than we started with a week earlier. With the various side trips up mountain peaks and across to lakes and waterfalls it was physically challenging but I finished with nothing more than a few scratches and a small blister. Although they were generally full of snoring hikers and smelly socks, the huts were good along the way. Each one had timber platforms that are used by those carrying a tent. We made do with just our sleeping bags and a foam mat to place on the hardwood bunks. As the warmth from the day dissipated into the cool of the night my only regret was how light my summer sleep bag was! So overall we covered the whole track except for the excursion up what is known as Pine Valley. This leads on to areas known as the Labyrinth and Acropolis. While I'd loved to done that, time didn't allow and I was very happy to see what we had in the seven days. I think we were also pretty happy to see the Lake St Clair Visitor Centre and have a hot meal before we hitched a ride back to Launceston. After being in Melbourne over the summer, it was time to head south across the Bass Strait to Tasmania. Travelling with a friend I’d met in Melbourne, we were fortunate to stay with a lovely family in the second largest city of Launceston. This made a pleasant base that we used to explore various parts of the island state. While the capital city of Hobart is more cosmopolitan, Launceston has an interesting colonial history and an unhurried ambience that I enjoyed. 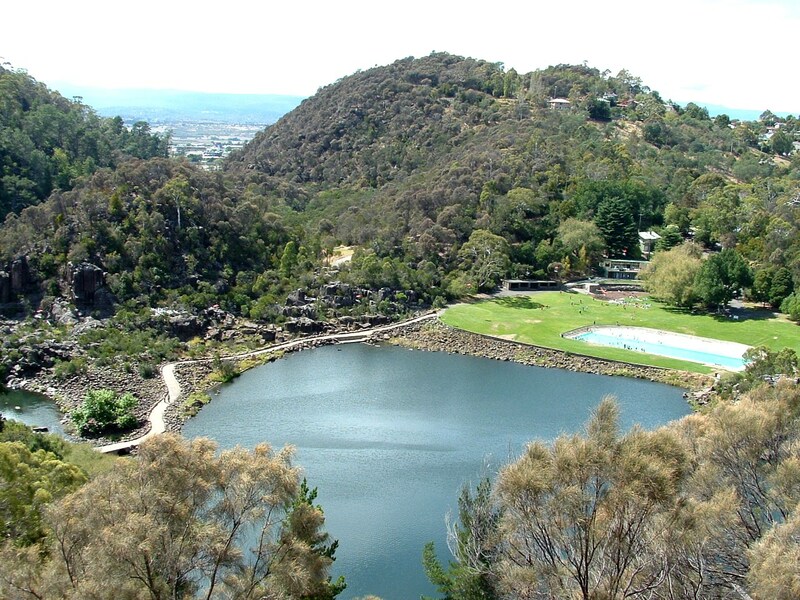 The tourist highlight of Cataract Gorge is just a short walk west from the central Brisbane St Mall and offers a range of walking tracks, swimming pool, picnic grounds and lookouts offering fabulous views. I walked all the way up to an old power station at a point in the gorge called Duck Reach before returning downstream on the other side. 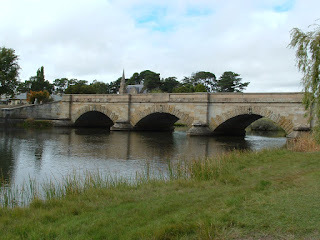 In the late afternoon I crossed the bridge where the South Esk River flows into the Tamar River and followed the riverside path through the green expanse of Royal Park to the mouth of the North Esk River. The city has been built around convergence of these three rivers and is where the mighty Tamar River begins its journey through the fertile Tamar Valley to the waters of Bass Strait. Next to where the old Launceston seaport was at the North Esk River mouth is the marina overlooked by modern riverside apartment complexes and eateries. 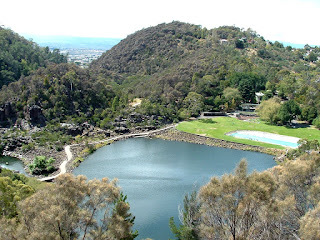 Before we left Launceston, our very gracious hosts took us for a day trip up the Tamar Valley. 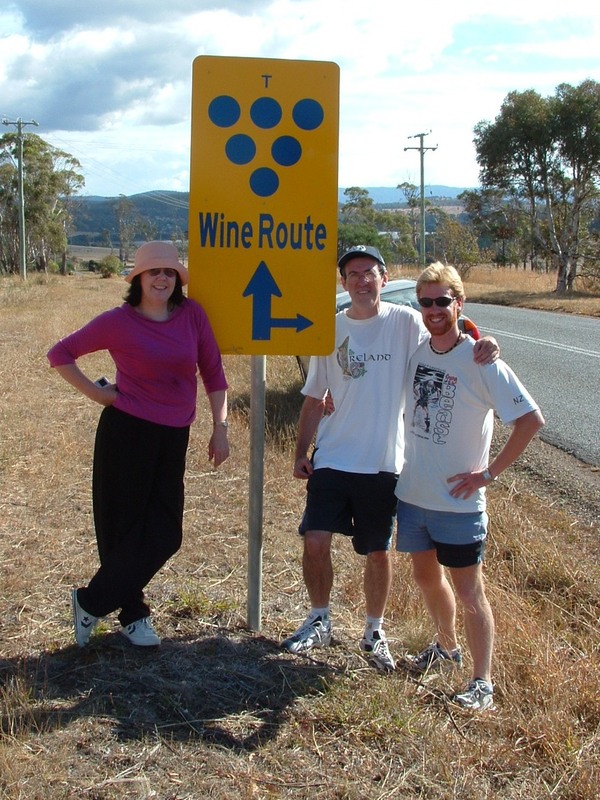 This 64km stretch of the Tamar River is Tasmania’s key wine producing area and the premium wines created here have achieved international awards. It was a beautiful, relaxing sunny day visiting wineries, sampling the product and eventually having a picnic with what we collectively thought was our favourite tipple. I’d probably say the day was unforgettable if all the wine I tasted hadn’t gone to my head and couldn’t my memory! 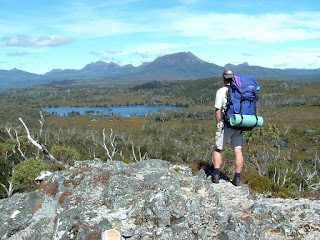 Tasmania is a mecca for hiking and the highlight is the Overland Track. 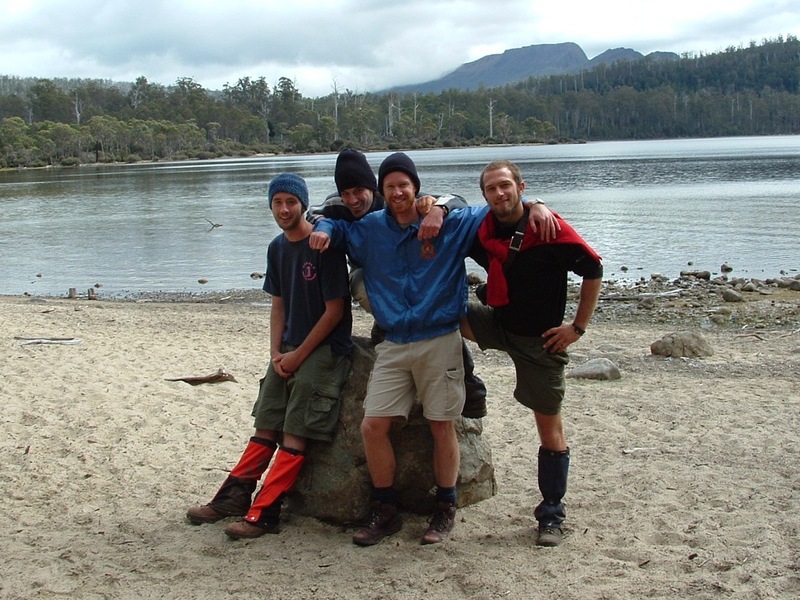 This is Australia’s most renowned trek and the 65km distance runs from Cradle Mountain in the north to Lake St Clair in the south. 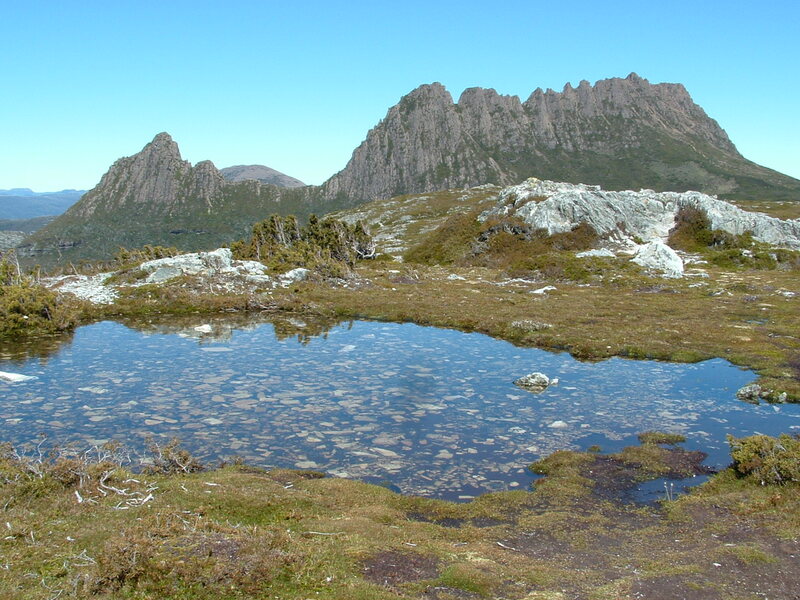 It offers unsurpassed scenery of high mountain peaks, tall eucalypt forests and sweeping valleys that are home to a variety of Australian wildlife. All we needed was some nice autumn weather and that’s exactly what we enjoyed as we began our hike. This good fortune with the weather continued for most of the journey and in seven days we only had about an hour of light rain. To give you a comparison, they hadn't seen any sun for the six days before we started and even had snow the previous weekend! In fact, when I talked to a tour guide that brings groups to renowned Marions Lookout he told me it was the best day he’d had of the entire season. This lookout at the north end of the track offers spectacular views of Crater and Dove Lakes and of course Cradle Mountain. Although time was short, I climbed the track to the summit of Cradle Mountain. It's usually a two and a half hour excursion from Kitchen Hut but I scrambled up and back in an hour and ten minutes. I simply couldn't let the opportunity go! 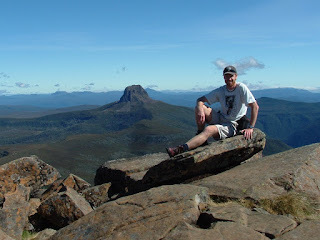 Further down the track I also climbed Mount Ossa which is the highest point in Tasmania. On a cloudless sunny day, the unobscured views were absolutely magnificent. A small plane flew past at about the same height while I was there so I felt like I was literally sitting on top of the world. I could have sat there for much longer but time unfortunately didn’t allow me the privilege.